powercloudcn has no other items for sale. Please note the delivery estimate is greater than 9 business days. 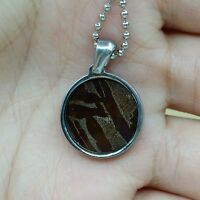 Genuine Meteorite Necklace! Sliced Seymchan Meteorite in Stainless Pendant! Genuine Meteorite Necklace! Sliced Seymchan Meteor in Stainless Pendant!